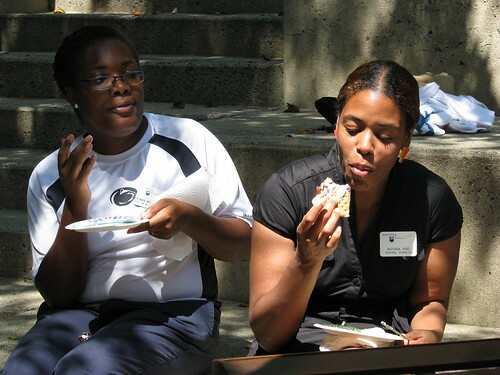 The Fair Trade s’more event at Penn State Brandywine, Global Exchange’s We Want More from Our S’mores, was a huge success! As we continue on our journey as a Fair Trade University, we have worked all summer toward raising awareness of the Fair Trade movement on campus, specifically with the staff and faculty. 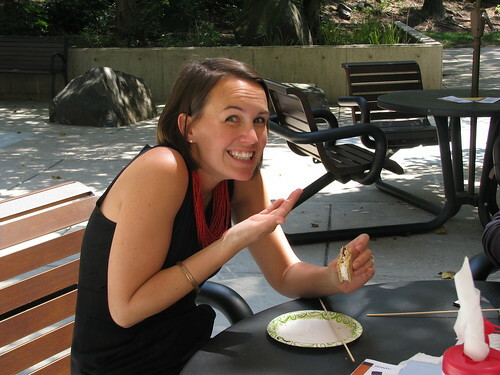 On August 16, 2012, we hosted an event where campus and community members could come to campus to make a Fair Trade s’more and hear about the challenges in the cocoa industry. Be sure to read about the lead up to our event and the resulting success! We hope that our experience can help other campuses learn how to best host a Fair Trade s’more event! For starters, we consulted the Global Exchange website and found their step-by-step checklist for setting up a s’more event. This was very helpful! 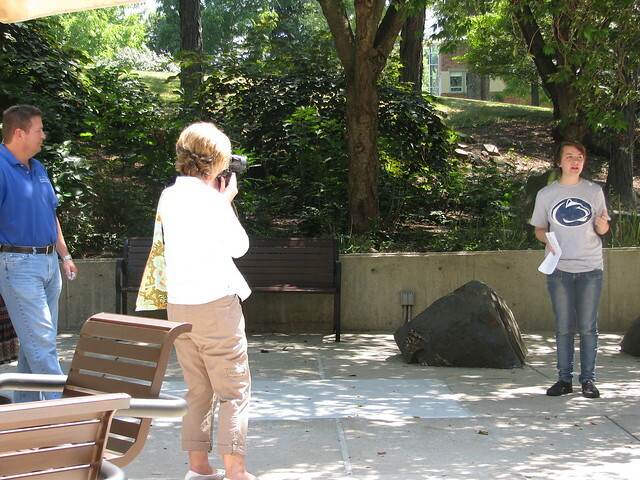 But there were some other considerations we had to make, especially doing this event on a college campus in the summer. Get permission first! We CANNOT stress this enough! Our campus does not have any fire pits or grills. We checked with the director of business services on campus to see if we could have permission to toast marshmallows (we saw instructions online on how to soften marshmallows in the microwave, but we knew it would not be the same). We received permission to use a propane grill outdoors in an open area, as long as campus security was present with a fire extinguisher the entire time (and he was!). The propane grill did not have the “flame” that is typically associated with making s’mores, but the marshmallows did get soft and gooey! 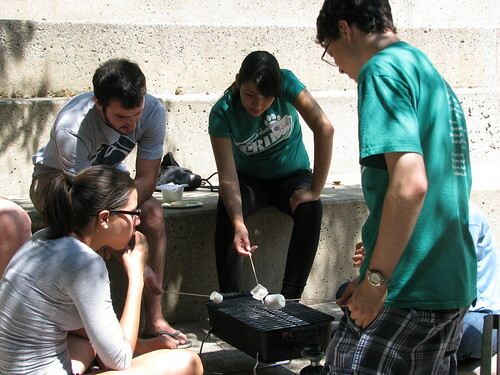 Be sure to check with the appropriate office on campus to see when, where, and how you can make s’mores. Get the word out. 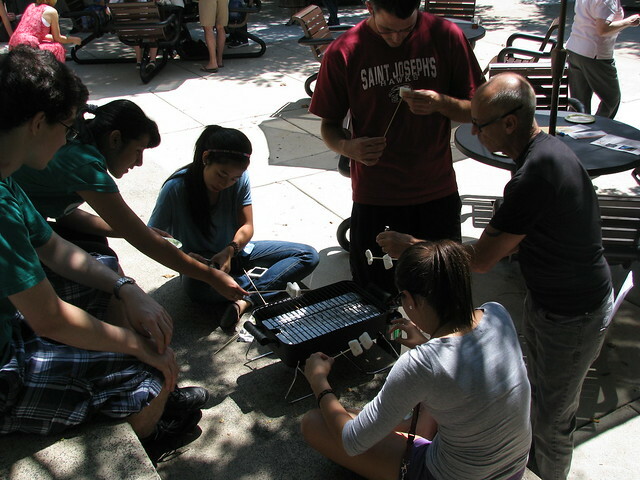 As the We Want More from Our S’mores campaign ran from Memorial Day to Labor Day, the timing made it difficult to get many students involved, but a great opportunity to get faculty and staff on board. We used our campus’s social media sites our own social media sites, and sent an announcement to our local town’s Fair Trade committee. We also emailed the faculty and staff email lists on campus to reach the people we knew would be around in the summer, and we sent specific invitations to campus administrators and alumni. It worked! We had 40 people in attendance, with a great mix of faculty, staff, and some students that were on campus that day. Have a RSVP form, but only use it as an estimate. We sent out a link to our online RSVP form in our emails and social media sites, so we could figure out how much food to purchase. We had 25 people fill out our online RSVP form, but as I just stated, 40 people showed up! Once word of mouth started spreading around campus about the event, we think people decided close to the date of the event to attend, and by that point, forgot about the RSVP. And of the people that did RSVP, approximately 10 of them did not attend. So although the RSVP form was a great idea, it did not exactly help with our planning (see our next point….) But we certainly didn’t mind the overflow of people, because the more we can reach out to, the better! Purchase more ingredients than the RSVP says you will need. Because we had more people show up than responded to the invitation, we were relieved we bought extra ingredients! And, we saw some people randomly chomping down on giant marshmallows and chocolate, in more of a deconstructed s’more form, which was fine by us! Think about jazzing up your s’mores with additional ingredients. We also purchased Fair Trade bananas from Whole Foods and organic strawberries, which allowed us the opportunity to show the Fair Trade logo to attendees, to let them know where to purchase these food items, themselves, and to discuss the developing Domestic Fair Trade certification movement (since there are no Fair Trade strawberries at this time). Choose a good time, overlap with the lunch hour. We set our event at 12:30PM-1:30PM, so that people could eat their lunch first and then come over for a s’more. This also worked well for staff/faculty that were in lunchtime meetings from Noon-1PM. We had many people come at different times in the hour, and we didn’t finish cleaning up until 2PM. So don’t be concerned if you don’t have a large group right when you begin, as people will filter in during the event. Include an education component. We gave a short talk about what is going on with child slave labor in the cocoa industry, letting people know which chocolate companies are Fair Trade, which ones are making progress, and which ones have much progress that still needs to be made. Include an advocacy component. We had several copies of the Global Exchange petition for the Raise the Bar campaign. By having multiple copies around the area we hosted the event, we were able to fill three pages with signatures. This allowed people to not only learn about Fair Trade chocolate, but to get involved by making their voice heard. Take lots of photos, and share the results. We took pictures and tweeted them during the event and posted a collection of photos in our flickr account after the s’more fest. 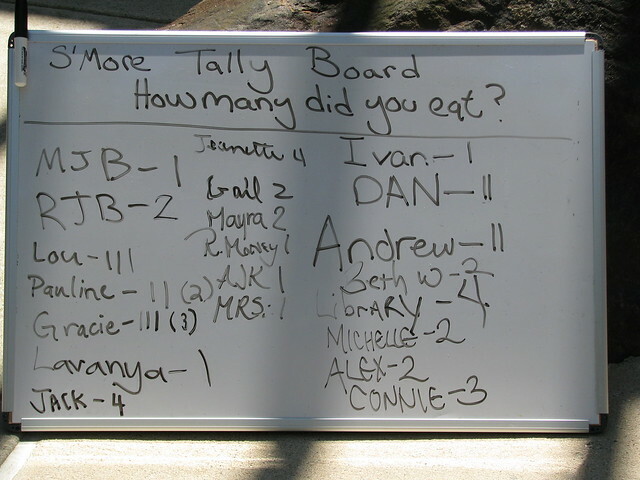 It’s a great way to document what we did and to share the results with others. We hope the conversation continues and people are inspired to try their own event after seeing and reading what we did! It’s question time! So, Dr. Laura Guertin and I were in Wegmans grocery store today, shopping for our campus fair trade s’mores event tomorrow, and we were wondering about some missing food labels. In our mad dash around the store, we came across Hershey’s Bliss chocolate, but found no Rainforest Alliance label on the packaging (Dove chocolates, we discovered on accident, does have a brand of chocolate that is Rainforest Alliance certified). To our understanding, Bliss chocolate is Rainforest Alliance certified, so why wouldn’t the labeling appear on packaging? Has anybody seen Bliss chocolates with the labeling, or does anybody know why the label wouldn’t be included? Our second question came up in the international section of Wegmans. I had spotted UK Cadbury chocolates the other week and wanted to check out their Fair Trade label. However, just like Bliss, I couldn’t find a Fair Trade label for the UK Cadbury milk chocolate bars. If the bars are really from the UK and are the right brand of chocolate, why wouldn’t the label appear on the packaging? Has anybody else out there had any similar questions? Does anybody know what is going on with these labels? 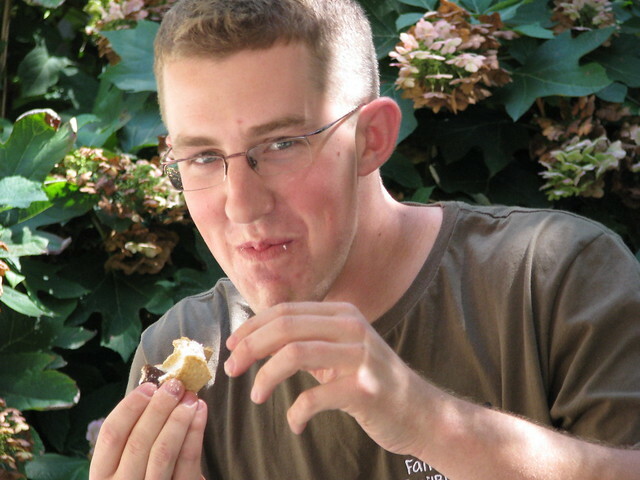 Seeking Ethical Chocolate – A Fair Trade S’more Event! The chocolate industry has been a growing point of controversy and change. An awareness of how chocolate is made and who makes it has stirred the need to move the industry in a more positive and humane direction. Seventy percent of the world’s cocoa is produced in West Africa, and it is estimated that around 1.8 million children are working on cocoa farms. In a study conducted (additional article) by Tulane University, it was determined that some of the children are working in very poor and often dangerous conditions, sustaining injuries, and some have been trafficked onto these farms (additional article). There has been an outcry for the chocolate industry to end child labor from many different organizations and groups. Some major chocolate companies involved with child labor are Mars, Cadbury, Nestle, and Hershey, and there has been some movement from each of these companies to mitigate the issue. Mars has promised to be child-labor free by 2020 and is working with the U.S. Department of Labor and the International Labour Organization to understand the complexities of child labor and find “…more effective strategies to combat trafficking…”. Britain’s popular Cadbury has also taken steps to promote a more ethical chocolate industry and became Fair Trade (additional article), putting Fair Trade certified chocolate on store shelves back in 2010 . Nestle partnered with the Fair Labor Association to identify if they have child laborers working under them and hopes to resolve any child labor issues they may have been supporting. Hershey’s chocolate has also begun to take steps to amend its business practices. Hershey has agreed to sell “Bliss” chocolate, a Rainforest Alliance certified chocolate bar. It has also pledged $10 million over the next five years to help educate farmers in West Africa and improve their trade to fight child labor. As America’s biggest chocolate producer, Hershey is under a lot of pressure to continue to make steps toward fighting child labor. On June 12, 2012, leaders from AIDS Healthcare Foundation, Global Exchange, Green America, the International Labor Rights Forum, and the National Guestworker Alliance, called for Hershey to step up and make reforms for its chocolate production and “…ongoing use of abusive child labor…”. 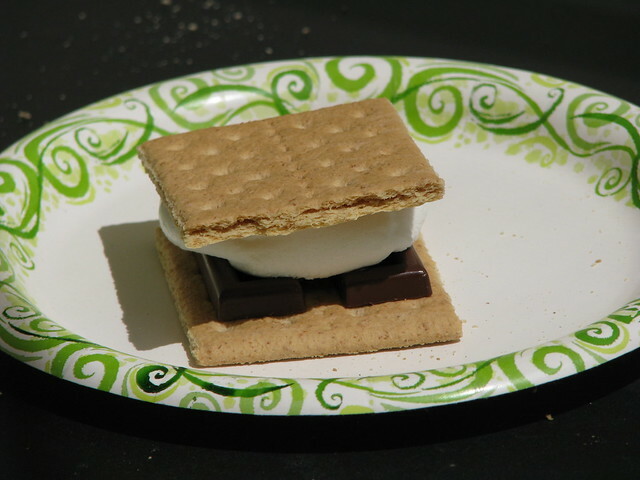 The “We Want more from our S’Mores” event was started by Global Exchange on July 4, 2012 to further encourage Hershey to move in a more ethical direction. 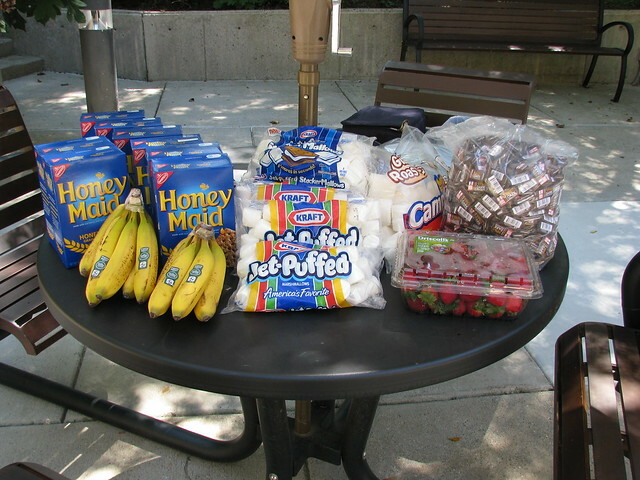 The event calls for making Fair Trade ingredient s’mores and runs until Labor Day. For more information about having your own event, click here. The Penn State Brandywine TrailBlazers will be participating in this event to promote a more ethical chocolate system, and hopes to not only encourage Hershey to continue to grow and expand its effort to fight child labor, but the rest of the chocolate industry as well. 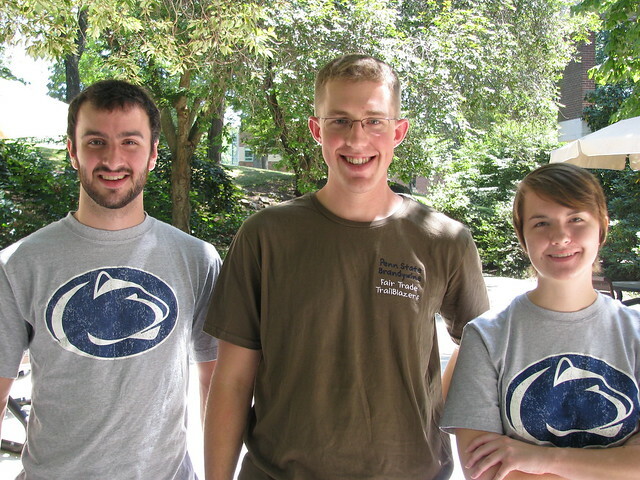 Our event will be held 12:30PM on Thursday August 16, 2012, in the Vairo Building Courtyard on the Penn State Brandywine campus. If you would like to attend for some additional discussion and to create your own Fair Trade s’more (or two, or three, or four…), please RSVP here!